Comprising a main island, an archipelago, and a scrap of the Brazil’s mainland, Florianópolis is the tourist-friendly capital city of Santa Catarina state on the country’s southeastern coast. With so much shoreline Floripa (as it’s commonly known) is a first-rate surfing destination that also attracts visitors looking to paddle board, kayak, sand board, and trek. All of this adventure makes for hungry travelers, so pull up a chair and experience regional flavours, while getting an insider’s glimpse into local history, geography, and culture. Try not to salivate! 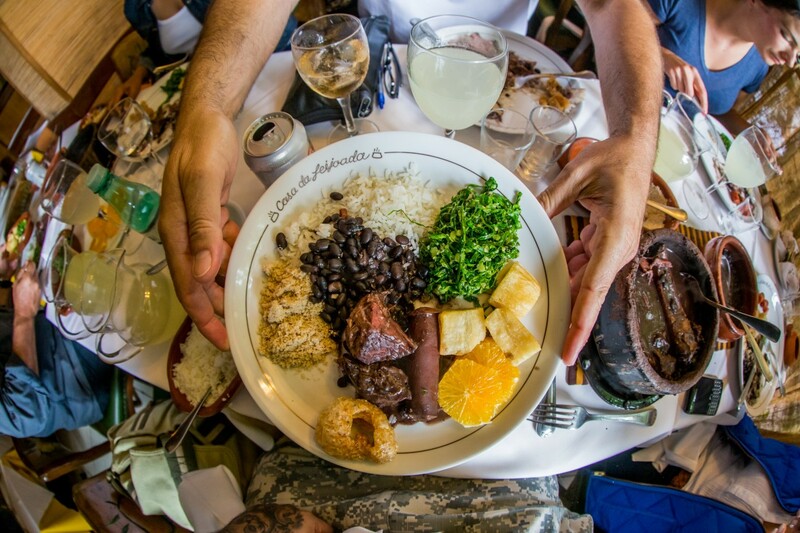 Ask anyone what the typical dish of Floripa is, and they’ll likely steer you towards feijoada. Slow-cooked in a clay pot and meant to be shared, this hearty and flavourful stew originated with the region’s African slave population. The Brazilian version (similar dishes can be found in other parts of the world) is based on black beans—feijão—with the addition of salty beef, pork, and sausage. Typically served over rice or with a side of farofa (toasted manioc meal), a feijoada feast is followed by orange slices to aid in digestion. Literally “cheese bread,” these baked balls are the size of a donut hole and twice as delicious. 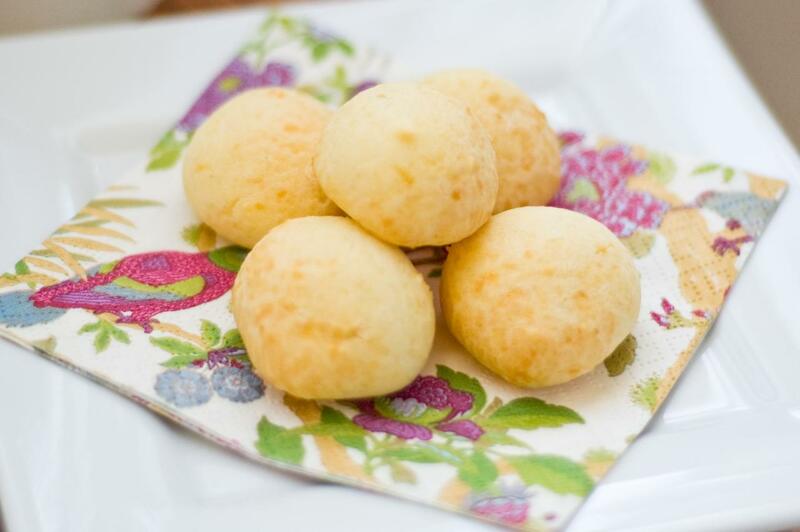 The secret’s in their texture—pão de queijo are made with cassava root flour and are unleavened. The resulting rolls are chewy, with a pleasing elasticity to the dough. Available from bakeries, groceries, and at virtually every breakfast, pão de queijo are savoury and filling, and nicely offset the sweetness of sliced papaya, pineapple, and watermelon, also typically found on the Brazilian breakfast table. Given that Florianópolis is basically a tropical island, it shouldn’t come as a surprise that fresh seafood is a local staple. In the historic village of Ribeirão da Ilha, oysters reign supreme due in part to the family-run oyster farm operating off the west coast of the island. 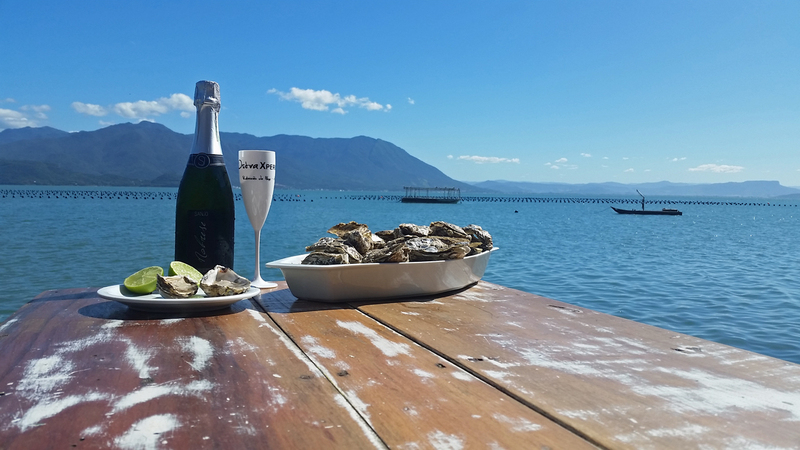 You can choose to sample this local delicacy at any of the many restaurants lining the main road in town, or go directly to the source for an oyster and champagne feast on the dock overlooking the beds (or, you could do like we did and experience both). The waters between the island and the Brazilian continent have proven to be particularly suited to growing imported Pacific oysters; where it would take an average of two years to reach maturity in their native environment, the mollusks reach their perfect size in about six months in Floripa. 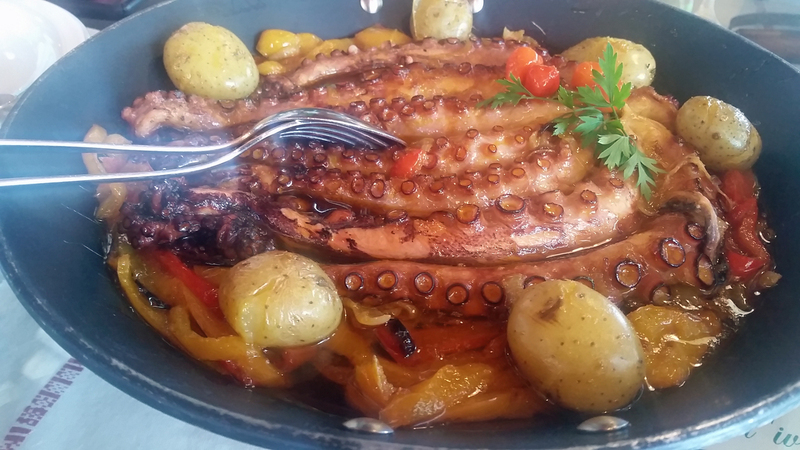 Octopus is plentiful in Floripa, readily available in the local fish markets and on most menus, and its simple regional preparation—grilled and served with roasted potatoes and peppers—comes directly from Portugal. Unlike the octopus of many inland regions, in Florianópolis the meat is tender and succulent, with the dense texture of a sardine fillet. Commonly referred to as Brazil’s answer to barbeque, churrasco is whole cuts of meat, skewered, and cooked in a churrasqueira made of bricks (the word churrasqueira also refers to the type of restaurant). Inside, waiters pass by displaying skewers heavy with beef, pork, lamb, chicken, sausage, and organ meat. Diners may choose to accept a serving, or pass, or — and this is crucial — accept a small taste. 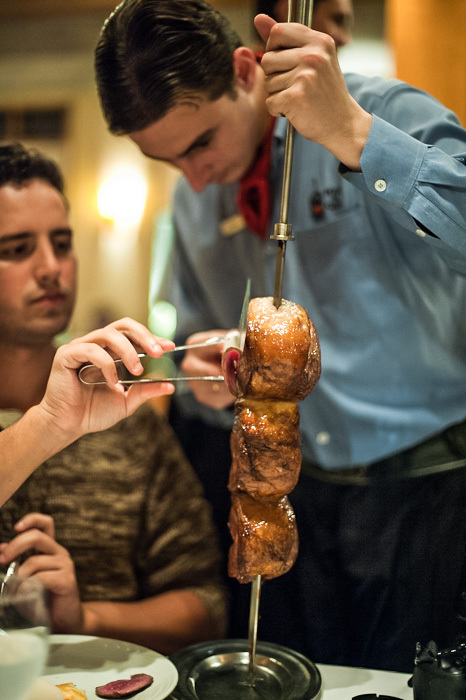 (Rumor has it that Eat Drink Travel ended their churrascaria evening prone on a chaise on the restaurant’s patio, groaning, “All-you-can-eat meat. What could go wrong?”) Get your fruits and veggies at the salad bar with sides like roasted mushrooms, hearts of palm salad, and pickled beets. 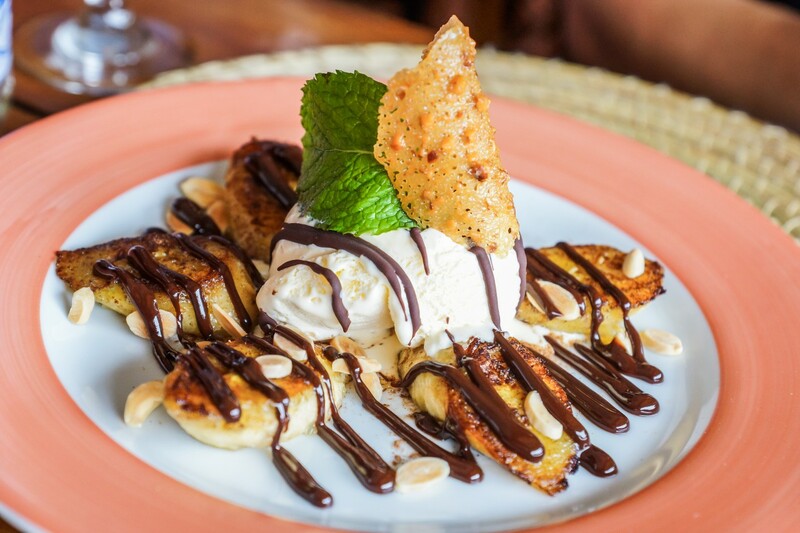 In a place that loves its sweet treats, fried bananas are the go-to as a side or dessert. Prepared properly, the fruit is served hot with a thin and crispy glaze, often paired with ice cream. Eat Drink Travel enjoyed each of these dishes on a recent trip as the guest of the Brazilian Tourism Board (Embratur) and Brazil Ecojourneys, a locally-owned and –operated IGLTA member tour company that offers adventures in southern Brazil including their annual Gay Surf Camp. Neither reviewed or approved this article in advance. Oh my god, I miss Brazil! I need to go back just to eat. My mouth is watering!